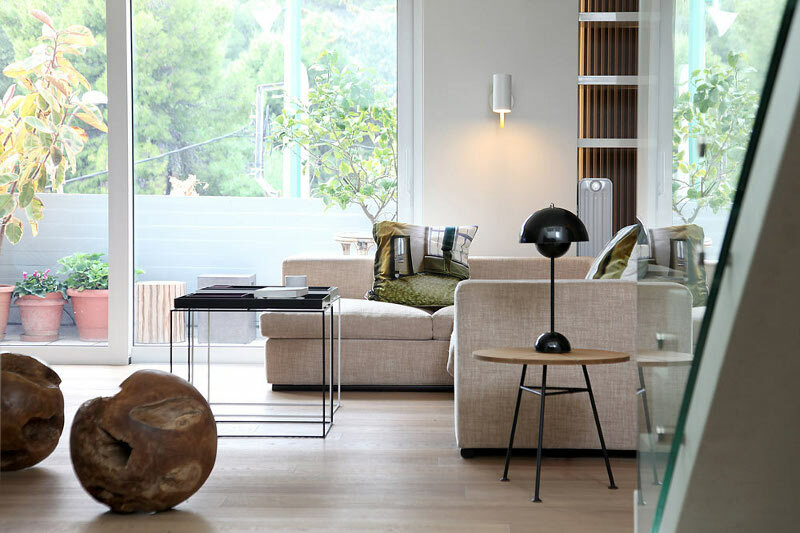 The Lycabettus Penthouse by Athenian architecture firm esé studio is a stunning example of how to make a super modern home feel warm and inviting. It's common to see concrete floors and an accent wood wall or two in a modern home, but this penthouse brilliantly flips that. Leaving the bleached wood on the ground so the floors are warm and inviting to walk on, and puts the concrete on the walls to keep an industrial modern look. Since the floor is such a light wood, it's still easy to incorporate a couple dark wood, textured walls like this beautiful one in the living room. The only pops of color are in the pillows and of course the beautiful blue Acapulco chair. This room perfectly mixes shapes and textures. I also love the idea that art doesn't have to be on the wall, those petrified wood spheres are gorgeous sculptures. I love the subtle colors of the built in storage and the dining room. The mismatched wishbone chairs add interest while keeping the room muted. The George Nelson light brings all the white pottery in the room together. No matter how modern the space, a rocking chair always makes it feel inviting. In my opinion, anytime an office can be in an open and airy place rather than in a room, it should be. This one has great storage as well, both hidden and open. I think the patchwork rug could look shabby chic in an average home but in this modern space it gives the room character. The main design triumph this house accomplishes is that each room is tied to the other effortlessly, which unifies the house. I think sometimes we focus on decorating each separate space in our house as if they were islands and we forget that the home should feel unified in some way. Apparently the Greek have this down. 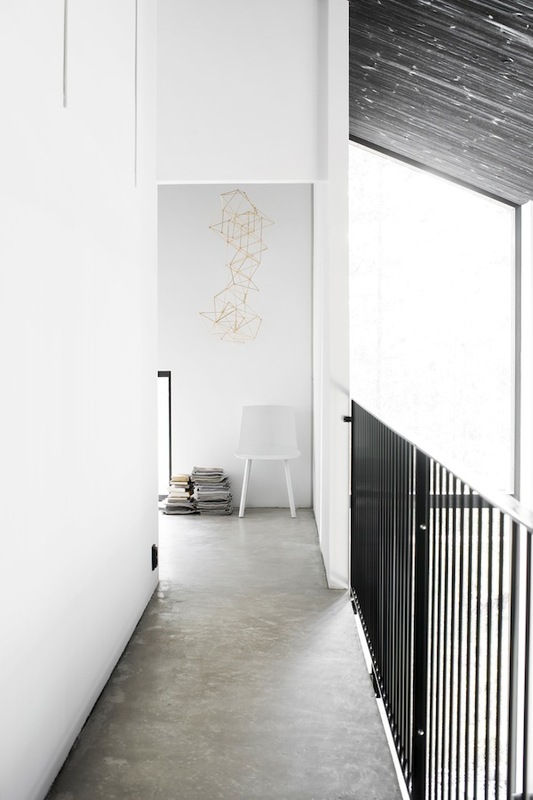 Scandinavians do minimal best and this house is shining example. Known as the Northern Light this home was my personal favorite from the annual Finnish design event called Housing Fair Finland. The perfection starts with the base essentials in the architecture, big open spaces with light flooding every corner. Then, the designer plays with textures and patterns rather than color. A feat that takes much more skill to pull of but as you can see, when it's done right you have spaces that are soothing but still incredibly unique and interesting. The designer sees every surface and object as an opportunity to use a different material, look and texture. He also doesn't over accessorize any of the spaces leaving the house a calm a soothing place to come home to. Oh and don't even get me started on the black wood ceilings! Gergeti is a beautifully simple coffee/tray table. It was recently debuted at the Fuoir Salone in Milan. NVDRS Design Studio has versatility down. Not only does the coffee table double as a tray table but you can choose different finishes for the metal legs and wood tops. Table top options include ones, with places for bowls, cups and vases. Breakfast in bed just got even sweeter. The beautiful copper and black combination is my favorite but to see them all click here for the NVDRS website.